Tirumala Tirupati Devasthanams Kalyana Vedika Online Booking and TTD Kalyana Vedika Online Booking at ttdsevaonline.com…. Tirumala is the Hindu temple located in Andhra Pradesh. The temple is regarded as one of the most auspicious places in India. People visit Tirupati for darshan as well as performing various pujas. One of the special procedure done at Tirupati is Kalyana Vedika. Tirumala Kalyana Vedika is the marriage ceremony performed by Tirupati trust. After the marriage, the couple will receive a receipt of the darshan which can be shown to get the marriage certificate at the government registration office located in Tirumala. To avail this facility when can have an online booking done well in advance to prevent any kind of chaos. Both of them should have completed the legal age of marriage, Bride should have attained an age of 18 years and bride groom should have attained an age of 21 years as on the date of marriage. Parents of both the bride and bride groom needs to present at the venue along with the aadhaar card. In case one of the parent has expired, the other needs to be present with the aadhaar card along with the death certificate of the other parent. In case both the parents have expired, guardians can come along with their Aadhaar cards and death certificates of the legal parents. If the parties are going for the second marriage, they should provide evidence whether the first marriage was dissolved or the death of the one partner. They need to provide an evidence for the same which should be a legal document from a competent organization. Depending on the demand on particular day and muhurtham on the particular day, the marriages may be performed in groups. After conduct of the marriage, TTD will issue a receipt of the darshan for 6 people who are allowed for a free darshan through special ticket of Rs 300/. Bride, Bridegroom and parents/guardians of the couple. One Rs 50/ room will be provided complimentary for one day. The room extension will be done for second day on payment. Second room will be provided on payment which is also subject to availability. Pilgrims can use the darshan receipt for the issuance of marriage certificate from the government office situated at the Tirumala. Along with this Tirumala authorities will also provide “Pasupu, Kumkuma, Kankanams, and Prasadam” to the couple. One can also contact the call center number for any related queries: +91-877-2233333/77777 or helpdesk number: +91- 8772263433 or email: helpdesk@tirumala.org for any queries (24X7). 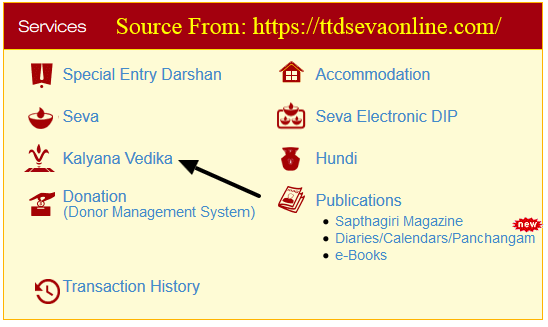 One needs to login to the TTD Seva Online website using the following link – https://ttdsevaonline.com/#/vedika you can fill the TTD Kalyana Vedika Online Booking are as follows…. When can login by using the user name and password. In case the person does not have the login credentials, he needs to sign up. After login to the page, person would be re-directed to the second page where on the right side there are various services. The person needs to select the “Kalyana Vedika”. After clicking on TTD Kalyana Vedika, the person would be re-directed to another page. This page would have all the guidelines and conditions, one should read all the conditions and guideline carefully to see if he fulfills the conditions to be eligible for marriage. All the guidelines have been provided in the above section earlier. Once the person has read all the conditions, he/she needs to click on “I accept the above guideline” and then click on “continue”. After clicking in the “continue” button, a form will open, here the person needs to submit all the details which include selection of the date and time when the auspicious ceremony needs to be performed. Details of the bride, bridegroom and their parents which includes the below mentioned details: Name of Bride and Bridegroom, DOB of both, Mobile number, email ID, Community from the drop down selection, Age proof card, Aadhaar number and details of the parents/guardians which includes their name, Photo ID proof, Aadhaar number, Death certificate in case of the death of any of the parent. After providing all the details, one should recheck all the details and after that submit on “continue” button. Booking once made cannot be changed later, thus the person should check the details properly before submission. The applicant will get the confirmation message in the registered e-mail once successfully submitted.